Forgotten Hits Salutes Bob Stroud's "Rock And Roll Roots"
This weekend is the big CD Release Party for Bob Stroud's new "Rock And Roll Roots" CD. It all kicks off tomorrow at the Oak Brook Borders Book Store. Bob unveil the track listing on his Sunday Morning radio program just hours before they officially go on sale at Chicagoland Borders Book Stores ... and, in that fans of the program help select the tracks by casting their votes throughout the year, you can ALWAYS count on finding a surprise or two on these collections. It's an annual tradition that many of us look forward to every year around this time ... and Borders Books has been a most-excellent host these past several years for the official release parties. Gotta be Volume 2 - chock full of lots of local flavor by the likes of Aliotta, Haynes and Jeremiah ("Lake Shore Drive"), "I Dig Everything About You" by The Mob, "Summer Sun" by Jamestown Massacre and the then-first-time-ever-on-CD "You Wouldn't Listen" by The Ides Of March. Other classics I never get tired of hearing include "I Love You" by People, "You, I" by The Rugbys, "Go Back" by Crabby Appleton and "One Fine Morning" by Lighthouse. A couple of your All-Time Top 20 Favorite Psychedelic Songs also made this CD: "Psychotic Reaction" by Count Five and the LONG version of "Crimson and Clover" by Tommy James and the Shondells. Rounding out the dozen tracks are "Let Me" by Paul Revere and the Raiders and "Nobody But Me" by The Human Beinz, a song we recently featured in Forgotten Hits when "The Office" used it as their show opening earlier this season! Case in point: "Take Me Back" by The Flock ... Stroud had been trying to get THIS one since the series began ... and it absolutely COOKS from start to finish ... it's one of those great forgotten, overlooked gems from The Chicago Music Scene, circa 1967 ... and it finally ended up as the closing track on Volume 7. Other songs that I voted for include "13 Questions" by Seatrain, "Shame Shame" by The Magic Lanterns and "Run To Me" by The Montanas, another great Top Ten Chicagoland Hit that completely fizzled on the national charts. Local heroes The Cryan' Shames and The New Colony Six are represented by their Chicago chart-topping hits "It Could Be We're In Love" and "Love You So Much" respectively ... and GREAT tracks like "Resurrection Shuffle" by Ashton, Gardner and Dyke, "Polk Salad Annie" by Tony Joe White, "Come And Get Your Love" by Redbone, "Ride Captain Ride" by Blues Image and the 1968 pre-Raiders hit version of "Indian Reservation" by Don Fardon round out the disk. Look over the complete set of track listings and you'll find a number of songs that have been featured over the years in Forgotten Hits ... and, more and more of the ARTISTS on these tracks have become part of the Forgotten Hits Family, too! What makes for a "Good" Edition??? Again, I'm probably the wrong barometer for this because, most of the time, I already have copies (in SOME fashion) of everything that appears on these CD's (although it IS nice to get pristine, digital copies to replace some of my long worn-out, scratchy 45's!) But Stroud always seems to assemble a nice batch of songs that you actually WANT to hear played again. Check out these track line-ups and decide for yourself ... I think you'll agree that you won't find a "dog" in the bunch! Stay tuned for this year's track listing ... it'll appear in our Sunday Comments Page tomorrow morning ... along with information on how YOU can get a copy, even if you DON'T live in the Chicagoland area. and it truly is a PERFECT fit. "Rock And Roll Roots" is more than just a radio show ... it's more a state of mind. The music takes us back to a special place and time and Bob's love and affection for this music comes through clearly week after week, year after year ... you genuinely sense that he enjoys bringing it to us as much as we enjoy listening to it. I have said it SO many times in the past and I'm happy to say it again ... I have NEVER ... EVER ... seen a radio station care so much about its audience ... and, on The Drive, your programming opinions and suggestions actually count! It has ALWAYS felt like "our" station ... and they strive to bring you the music that you actually want to hear. Free annual concerts (in the form of Drive Birthday Parties!) have become a HUGE event. It seems like they are ALWAYS doing something for their listeners. (In fact, brand new Drive keychains arrived in the mail just the other day ... and I'm sure 2011 calendars will soon be on the way, too ... all for being a "Loyal Listener" to the station.) They truly make you feel like they APPRECIATE your loyalty and listenership. And there's a charitable aspect to the "Rock And Roll Roots" CD, too. For the past couple of years, The Drive has chosen LifeSource as their "charity of choice", donating proceeds from the sale of the annual "Rock And Roll Roots" CD to this great organization ... a nice extra touch, knowing that a portion the money raised by these sales is going to a good cause. And this year they did something new that they've NEVER done before ... last Saturday, October 30th, The Drive held what they called The Rock And Roll Donor Fest, held at the Hyatt Deerfield Hotel in Deerfield, IL. If you came by and donated blood, you were able to walk away with a FREE copy of the brand new CD ... a full week before you could even buy it! (This is all the more impressive when you consider that the track listing has ALWAYS been a classified, well-guarded, top-secret event!) I am SO glad to see that The Drive took an extra step to help show their support of this good cause ... and were even willing to let the cat out of the bag a week early to do so! Once again, it just shows their commitment and support of their sponsor ... and we commend them for it. And, if a savvy little promotion like this gets a few people to donate blood who might not typically do so, all the better ... EVERYBODY wins! Meanwhile, for those who are interested and would like to learn more about LifeSource and what they do, here's a little more info about the whole event: Click here: WDRV's Bob Stroud Joins LifeSource For Rock 'N Roll DonorFest Chicagoland Radio and Media. I will tell you that the parties are ALWAYS a great time, featuring special "Live" In-Store Appearances by many of our "Local Heroes" ... who are always on hand to help Bob launch the latest edition of this great CD Series. Hope to see some of you there! Meanwhile, wanna own a "piece of the rock"? Click here: Amazon.com: Bob Stroud's Classic Rock Roots Volume 1: 1. Low Rider - War (S) 2. Itchycoo Park - Small Faces (S) 3. Got this posting from Sean Ross' "Ross On Radio" column last week about the brand new Chicago Radio Online Channel ... just in time for Christmas! It's five days before Halloween and radio’s Christmas season is here. On the heels of WSMM (102.3 The Stream) South Bend, Ind., launching an all-holiday music format, Accu-Radio has unveiled its Chicago Christmas Channel, part of its rapidly expanding Chicago Radio Online suite of channels. Still officially in beta testing, Chicago Radio Online has been lining up veteran Chicago radio personalities in recent weeks to host a variety of Accu-Radio formats. Musically, the Chicago Christmas Channel is described as a mix of Accu-Radio’s multiple holiday channels. The 90 minutes or so that we listened to mostly overlap with the all-holiday format as done by AC radio for the last decade or so, but with a few treats and alternate versions that provide a nice point of differentiation (along with the spotload). And coming in Thursday’s Ross On Radio, the 100 most-played holiday songs of 2009 as monitored by Nielsen BDSRadio. Hint: the top 10 includes three of the songs above. You recently got into the subject of Christmas music. Here in OKC, back in the late fifties-sixties, Christmas music would not be heard on radio stations until about ten days to two weeks after Thanksgiving. For years now, stations here start playing Christmas music at one minute past midnight on the day after Thanksgiving. To me it is just like department stores getting out their Christmas items to sale before Thanksgiving is here. Would you believe that just a week ago I drove by a house here in the city area and they had their Christmas decorations already up on their front porch as well as their front yard. Did I forget to mention that Halloween hasn't even gotten here yet?!? Some times I do wish that Grandma would get run over by a reindeer. One final Christmas item: I always did like Ray Steven's 1962 Mercury tune SANTA CLAUS IS WATCHING YOU better than his remake of many years later. Here in Chicago, it apparently now starts in OCTOBER!!! For me, two weeks of Christmas music is enough ... I take that back ... devote the Day After Thanksgiving to Christmas Music to get people in the mood ... this is typically the biggest shopping day of the year ... then scale it back a bit ... say one song every couple of hours for the next two weeks ... increased to one song per hour for the next week ... then maybe one every half hour and fill Christmas Eve and Christmas Day with non-stop Christmas music to give the radio folks time to spend with their families ... and then put it away for another year. On a related note (and we've covered this a couple of times before in Forgotten Hits) ... isn't it interesting how, at Christmas Time, ALL genres of music are played side by side and nobody thinks ANYTHING of it ... all of a sudden it's perfectly ok ... down right COOL, in fact ... to mix Andy Williams and Johnny Mathis in with John Lennon, David Bowie and Mariah Carey Christmas music ... and it ALL fits ... and it all sounds perfectly fine ... NATURAL, in fact! We've been working on this topic for a while ... but apparently nobody working IN radio quite gets it! Colorado Disc Jockey Mason Ramsey has been pushing (and featuring) his "Music Of The Ages" format for years now on rockandrollheaven.net ... you're likely to hear songs from the '40's, '50's, '60's, '70's, '80's, '90's and today played side-by-side on a regular basis ... with NO excuses or explanations ... simply because the music FITS and feels right. A good song is a good song ... but radio has gone out of its way to segregate each and every format and then completely SATURATE their audience by playing the same 200 or 300 songs over and over and over and over again ad nauseam ... to the point that we now turn off some of our all-time favorite songs because we're simply sick of hearing them. Variety is COMPLETELY missing on today's radio dial ... far too often, even teasers like "you'll never know WHAT we're going to play next" simply means "the same frickin' song we played about four hours ago"!!! I couldn't agree with you more on this topic of Christmas music being played or maybe not played on radio stations. In the late fifties - early sixties here in OKC for a period of about 4-5 years, the local top 40 radio station would put out a weekly Christmas survey along with their regular weekly top 40 survey beginning around the second week in December. This would be composed of some 40 Christmas singles out at the time with some albums listed at the bottom of the survey. Undoubtedly my all time favorite Christmas song is the Ronettes' version of SLEIGH RIDE, which came out on the Phil Spector produced album A Christmas Gift For You in December of 1963. In fact, it was either in the Summer of this year or the Summer of last year, that I got that album out here at home and played that song here at my house. For one night in July for about two and a half minutes it was Christmas time.in my den. 14. Last Christmas – Wham! Here's a story that will warm your heart -- and those of most, if not all -- of your Forgotten Hits readers. The great 'classics' of the 50's are alive and well with today's youth -- at least in Middle Tennessee. This past Friday I had the pleasure of speaking to approximately 250 6th, 7th and 8th graders at Page Middle School in Franklin, TN -- approximately 25 miles southeast of downtown Nashville. My daughter, Taylor, is a 6th grader there and two of her teachers -- band and chorus -- invited me to speak to their classes about the development of the music industry since the introduction of the Edison 'phonograph' in 1877, and Nashville's contributions over the past 85 years -- since the debut of the Grand Ole' Opry in 1925. I brought in various music tracks -- along with an Edison cylinder disc, 78 and 45 RPM records, an early 40's album (soundtrack to the 1942 movie, "Holiday Inn," which introduced the song that would go on to become the biggest selling 'single' of all-time, Bing Crosby's "White Christmas"). 1941 / 42's Andrews Sisters classic -- and WW 2 moral booster -- "Bugle Boy Of Company B,"
1958's Danleers doo-wop single "One Summer Night,"
1959's Everly Brothers classic, "Let It Be Me,"
1963's Beach Boys hit, "Surfer Girl,"
1964's first Beatles #1, "I Want To Hold Your Hand"
But the two that went over the absolute best -- and that a number of students sang along to word for word -- were The Chordettes' 1954 classic, "Mr. Sandman," and The McGuire Sisters 1957 hit "Sugartime." Those two songs had the kids dancing and enthusiastically singing along. Kinda does your heart good -- to say nothing of restoring your faith in today's youth! Perhaps the better question should be "Why WOULDN'T they love this music?!?!?" WE all certainly did ... and it captured our hearts at an age when we were most likely to be influenced by the sounds happening around us. Need some convincing? The other day Scott Shannon devoted the better part of a day to TV Themes ... and got an INCREDIBLE reaction. The listeners absolutely LOVED it and responded in kind!!! Let's face it ... after 40-50+ years, we already KNOW all of these songs ... sure, we like 'em ... and that's why we tune in ... but the truth is you can hear them ANYWHERE, anytime ... virtually ANYWHERE on the dial ... 'cause everybody's playing the same stuff. We tune in now to be entertained ... the moments in between the songs has become every bit as important as the music itself ... the little tidbits about the songs and artists, any added bonus to the day in, day out, same old / same old broadcasting. To a degree, we almost tune out the music ... it's become THAT familiar. How many times a day do you find yourself completely zoned out to where whatever's playing is simply background noise? What perks us up THESE days is that "something different" ... listening to what the deejay is actually saying or the shock in hearing one of those "Wow Factor" songs that makes you whisper to yourself "Wow, I haven't heard THAT one in ages!!!" or "Wow, I can't believe they played THAT!!!" THIS is why altering the playlist has become such a HUGE factor ... 'cause the rest of the time you may as well be on auto-pilot or in zombie-mode. You want MORE proof? A day or two before that, Scott Shannon played the #1 Song On This Date, 40 Years Ago Today ... it was "I'll Be There" by The Jackson Five, which topped the charts back in 1970. Now I listened to an AWFUL lot of radio in 1970 ... and I don't remember anybody EVER featuring The #1 Song from 40 years ago back then!!! Nobody would have thought to play the #1 Song from November 3rd, 1930 ... it would have held no interest or appeal. This is probably true of the majority of the music from the 1920's, 1930's and 1940's ... but it is NOT the case of the music of the rock era. The music of the '50's, '60's, '70's and '80's still generates a positive response ... we WANT to hear it again because it is PART of us ... we can RELATE. Got a few emails after our piece on The Fifth Estate ran a week or two ago ... here are a few more goodies! I saw your recent piece on The Fifth Estate and really enjoyed it. 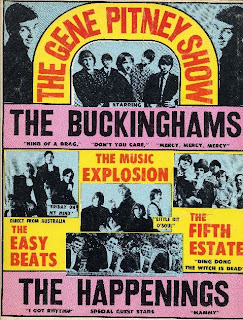 I saw The Fifth Estate on a Gene Pitney tour with The Buckinghams and The Easybeats ... Great show! My friend in Portland Kevin owns the harpsichord that was used on "Ding Dong". He bought it from one of the band members years ago. When Kevin got the Harpsichord he also got a cassette tape of some unreleased songs I made into a cd. A special shout-out to the 5th Estate whom I have always loved. That was fascinating stuff ... who would have thunk that parts of that tune came from 1612! That just blows me away. The only damn thing is now I have that flute part going thru my head non stop ... it won't go away!!!!! Oh, and regarding "Ding Dong the Witch is Dead," an inordinate amount of guys loved to belt out that song when it was popular! What gives with that??? What a funny story about Ding Dong the Witch is Dead. And now she's your ex-wife ... shocking! I am the second oldest of seven and when I would get into trouble with my Mom I would sing Ding Dong the Witch is Dead under my breath. One time she heard me and she said, "Oh no I'm not, Stacee, I'm very much alive and my hearing is too." Regarding that clip I sent of "Ding Dong The Witch Is Dead" ... this is not an out-take; this is what was recorded as a Demo in a basement!! Sounds like it was a bet at some party ... that you could turn any tune into a hit ... and that is what was accomplished! The hit, with some minor difference, is nearly identical to the basement recorded Demo. Impressive!! You're too much there, Kent man. We don't know how you do it!?!? And John, don't worry - you were getting one whether you wanted one or not!!! to me and the band it feels really really a lot like when we were playing in the Village and The Blues Project was in one club, the Velvet Underground was in another, The Byrds were in another, The Fugs were in another and we The 5E were in another. There was a certain undergroundness yet within striking distance for any who cared of big time rock and roll there then. although of course instead of being in a club with a limited audience you are on the internet - with truly an unlimited worldwide audience. I don't know what to make of that - except this all feels so much like 63/64 here again where a lot of the radio and TV DJs were just people like you and possibly us who just plain old liked a certain type of music - which early on at least seemed to have a certain positive effect on the public and they just liked it and did it - no matter what!! Doesn't make sense?? But probably the less sense it all makes the more fun it is - don't you think? AND the more the people really NEED it! In our earlier piece, Furvus mentioned that The Fifth Estate had recorded "Ding Dong The Witch Is Dead" in several foreign languages, too! A bit unusual by this point as typically, by 1967, a worldwide hit was sung in its native language only ... or, at most, translated into ONE foreign language. Ironically, Jersey John questioned the same thing when he came across an Italian snippet ... so we asked Fifth Estate Drummer Kenneth Michael Evans to enlighten us. Maybe you can get that fine Fifth Estate drummer, Ken, to comment on this Italian Witch!!! Like, whose idea was it to sing an Italian version; any success in Italy? ; was there someone to help with the translation? ; was it sung in other languages? ; are these Wayne's actual vocals, etc.?!! I altered the sound to make it more presentable. FORGOTTEN HITS: How many languages did you do in all? KE: We never took the easy - or most obvious - way out!! 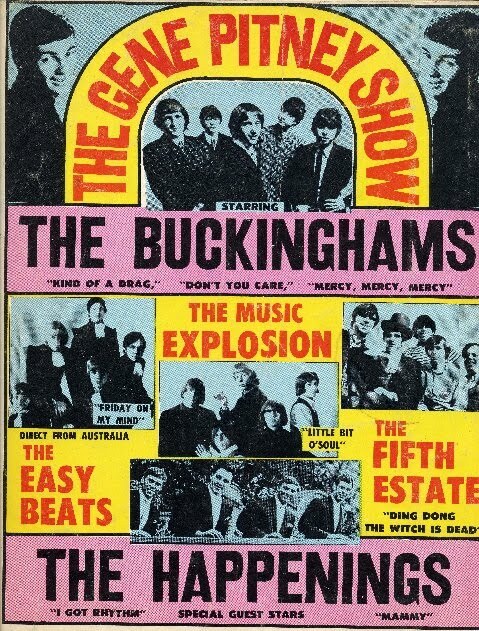 That just was never interesting enough to keep us pumped or alive during the early British invasion days. So we knew the Beatles had released some of their tunes in German and we knew Brian Epstein had interest in signing us and we thought that language thing was really pretty cool. It was or at least seemed a sort of respect for the language of others to release songs in the other person's language. We though that was cool and we didn't miss the idea that maybe a few other listeners could get into what we did that way as well. So all in the band wanted to do this. Plus at that early stage we were always conscious of trying to keep up with what The Beatles were doing, as they were more than setting the pace at that point. So here we decided to two or three-up them and do FIVE languages. I am not really sure how many languages The Beatles recorded in ultimately, but at the point, where we were doing this in '67, we only knew of their German versions. FH: Who translated these for you? And did you just perform these phonetically? What kind of coaching was involved? How long did it take to re-do the hit so many different ways? And was that actually Wayne singing on all these versions? KE: We all knew smatterings of these languages, except Japanese, either from grandparents or school. But - when we started, it wasn't so easy as we thought, and some of our apparently rather "loose" translations from the very little we knew turned out to be hilariously incorrect when we finally brought in a couple of translators and coaches from the Berlitz School of Languages in NYC who actually knew what the heck they were doing. We were a little hesitant to ask such a place to do such a thing, because if you think about it even a little bit, it was just such a totally bizarre thing to do! BUT - We liked that! It was a good thing we brought them in because some of our translations and pronunciations were so incorrect that we probably would have offended about half the people in the world if it had gone down that way. This, in fact, was one of the more difficult things we ever attempted, or maybe any rock and roll band ever attempted?? Fortunately though, with Wayne being the lead singer on that one, most of this fell on him. The Berlitz folks just fell in love with Wayne's personality, immense sense of humor and huge talent and abilities and, as usual, he handled what really wasn't easy just fine AND all while the clock was ticking and the time running up in the studio. As usual the whole thing turned into what else? - that's right - A PARTY! The Berlitz folks found it a complete gas to be included on something like this and they did a great job on the translations and for the most part they phonetically coached Wayne right in the studio. He would just keep doing takes until they said he had nailed it. Not really easy to do while the rest of us were running around there partying and laughing at all his mistakes. Although he was really surprisingly quick anyway for such a thing, about two full nights of studio time, but he had studied the translations at home first. Wayne did know a lot of Italian as his mom was, but on the others he had no clue originally. AND although Ricky and I knew some French from school and Bill Shute's parents were French Canadian, and Doug (Duke as we called him) had some German in his background, our input was really useless. Sitting there laughing our heads off at Wayne's mistakes turned out to be our primary input. So that was AND IS Wayne singing on all those versions. One other sort of interesting thing on all this is that the background Ooh La La La's, which were sung by Doug and Ricky on the original, were all left the same on these EXCEPT!!?? on the Japanese version, as I recall!!?? At least the story in the band has it so, as we have never heard it since it was recorded. Apparently, on the Japanese version (and I hope this doesn't offend anyone today - it was really only intended to be humorous at the time), instead of those Ooh La La La's, Doug and Ricky sang Ooh Ra Ra Ra's. Oh my? I don't know whether to blame that on them or the Berlitz translators. I think I'll blame it on those crazy Berlitz folks - yeah. They kind of got into that crazy party mooood as things went on there. But it went over in Japan apparently. FH: Finally, did any of these foreign versions become big hits? KE: As I said it didn't seem to offend those in Japan at the time. They rather liked it, as I believe this was the only other country where the foreign language version charted. The English version charted in many countries and was out on EMI and Parlophone in England and Europe, although only on a large independent Jubilee here in America. I love the Japanese culture and how much they loved and STILL love rock and roll, much more than most other countries including America, especially including America at the moment. Although we are about to test that out shortly with our new non-nostalgic, latest and greatest 60s rock and roll album ever recorded, at least Shel Talmy who made The Kinks, The Who and David Bowie famous already thinks so. Well it will at least be the latest - that's for sure. To us, the worst thing about any of these releases is that we the band don't even have copies of any of these, except the Italian version which one of the Forgotten Hits readers was kind enough to send us a couple of years ago. A number of the collectors who read FH have been helpful in any number of ways to us and we do really appreciate that more than I can say right here. The unfortunate state of affairs with many of the American record companies we worked with at the time have kept a lot of these releases from getting more current re-releases. Wouldn't it just be great if some of these just cooperated and made things available again!!?? Well I must be crazy to even think such a thing, this is "the Music Biz" after all, much of which I love obviously, but not this part. I must be looking for a PERFECT WORLD or something, and the only one like that we are ever going to find will be on our new TIME TUNNEL album. So for now and for me anyway our new album is as close as we are going to get to all that I guess. Thanks, Kent, for such a cool idea! Kent Man - you're such a groove! I loved the Monkees post. I guess that isn't news to you as you know I am a Monkees fan. Yes, there was a single that Kirshner put out with Davy called My Favorite Monkee Sings. I don't have it but I have seen it. I read that the reason he titled it that way was that, unlike the other three, Davy was always willing to go into the studio to sing anything for Kirshner. I am not surprised to read that he may have wanted to give Davy a chance for a solo career. 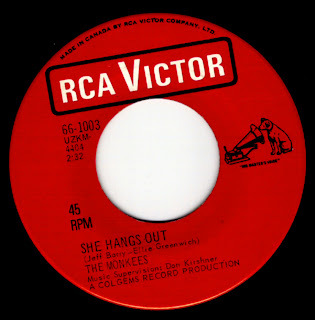 A week or two ago we ran the "early" Don Kirshner-endorsed version of "She Hangs Out" by The Monkees. 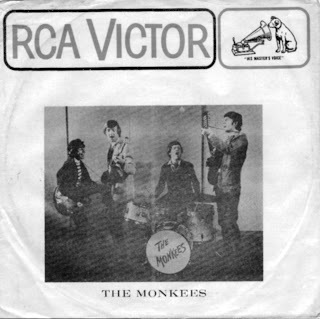 While I knew that this actually made its way to Canadian release as a single (Colgems 1003) before it was pulled from the market (thanks to a lawsuit filed by The Monkees that ultimately got Kirshner fired, despite the fact that he had spear-headed their career and virtually overnight made them the hottest recording act on the planet! 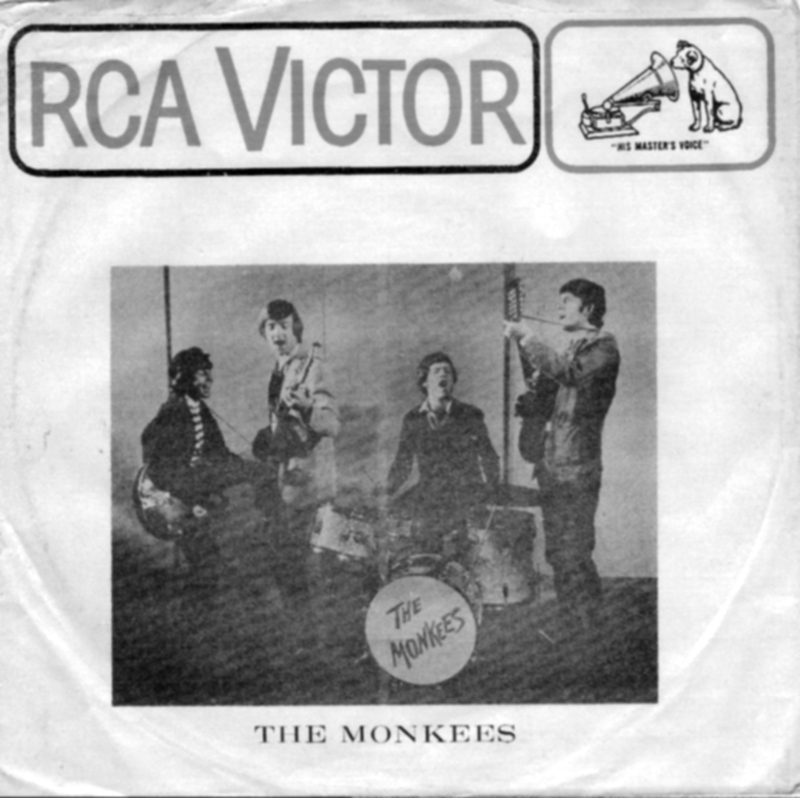 ), I hadn't heard that an unauthorized version of the song was ALSO pressed as a single under the vanity-heading of "Davy Jones Presents" / "My Favorite Monkee Sings". Despite EXTENSIVE research into this issue, I have yet to turn up a single shred of proof that this is the case ... no photos, no documentation ... NOTHING! My late brother was a teenager in the 1960s, and among his things are many records from those days. Most are plainly marked and obvious as to what they are, except for one mysterious item, a picture sleeve with no record inside. My online searches for “Davy Jones and Ted Sully” came up with nothing. Since no mention is made of anyone else, I assume this sleeve was originally accompanied by a Davy Jones recording, unless Mr. Sully is also a recording artist, which I doubt. If not Davy, which record belongs to this sleeve? Can't say exactly which, but we are certain it is one of four. We know this because the entire record output of the Davy Jones Presents series numbers four singles, all packaged in the exact same nameless picture sleeve. The short-lived Davy Jones Presents vanity label came and went in the summer of 1967, perhaps in part because being a Monkee at the peak of their popularity left Davy little time for anything other than Monkee business. The fledgling label's executive vice-president was industry veteran, Jack Angel, co-founder of the Herald label. Among his more successful Herald artists are: Mello-Kings (“Tonite, Tonite”); Nutmegs (“Story Untold”); Faye Adams (“Shake a Hand”); Maurice Williams & the Zodiacs (“Stay”); and Turbans (“When You Dance”). That the company made only generic picture sleeves probably indicates they printed the sleeves before they knew the artists and titles of their eventual contents. 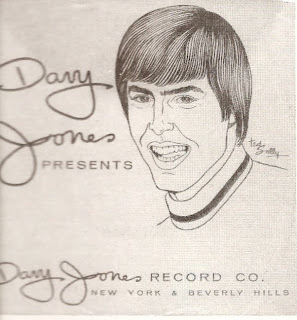 The same Ted Sully drawing of Davy, and text you see on the sleeve, is also used as the company logo on the record labels -- peculiar because Jones is not heard on the songs, and there are no images of those who are. 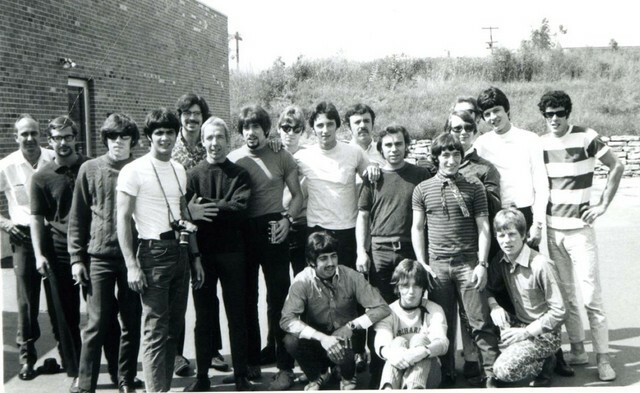 The 50 winners, one from each radio market, were treated to dinner and a recording session with Davy Jones in Los Angeles, and other fun stuff. Each teen winner was accompanied by the parent or guardian of their choice. IZ ZAT SO? : Davy Jones, the first member chosen to be a Monkee, must have liked “Gypsy Girl,” an obscure 1966 release by the Staccatos (Syncro 661). 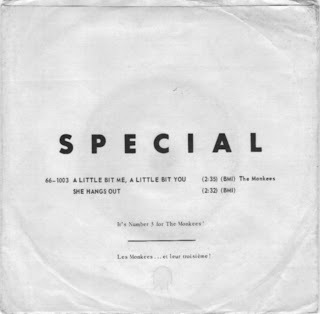 One of the first moves by Davy Jones Presents was to reissue both sides of the Syncro single on their label, and to use its selection number (661) as a starting point for his company's numbering. 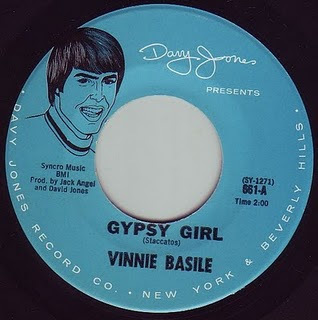 Rather than credit the Staccatos, the DJP single is shown as by Vinnie Basile, the featured vocalist of the Staccatos. I did read that, after the fourth single had been released, Jones sued his label partners and manager ... something about misappropriations of royalties and funds (or something to that effect) ... and the singles (which never sold well and never charted) ARE pretty scarce ... ESPECIALLY with the Davy Jones picture sleeve! OK, here's a real interesting 45, not only because it's on the famous "Davy Jones Records" label, but because there might be some confusion about who this actually is. 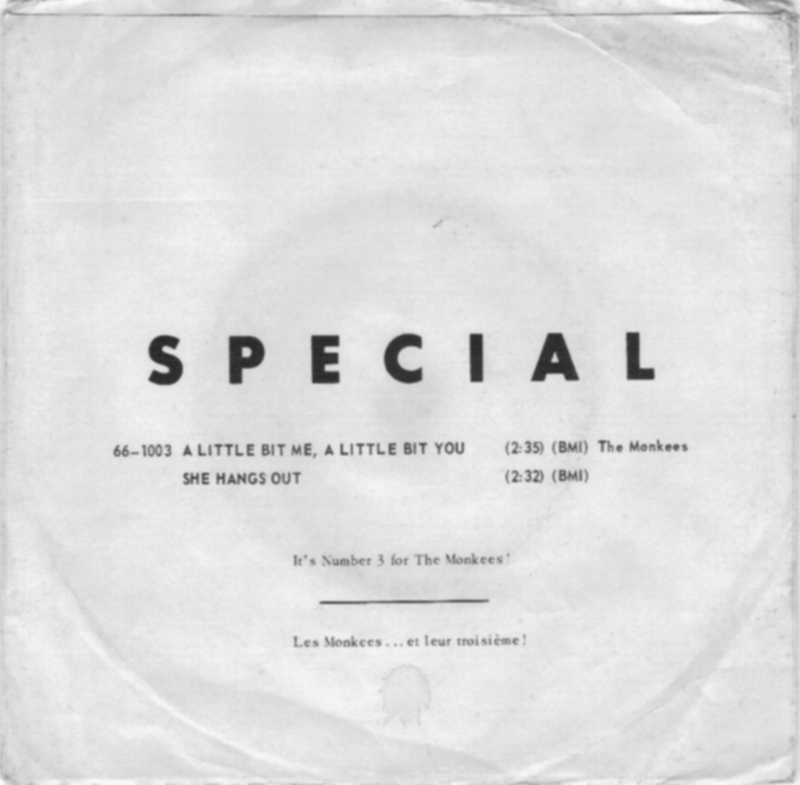 This 45 originally was released on the Syncro label (from who knows where) credited to The Staccatos. 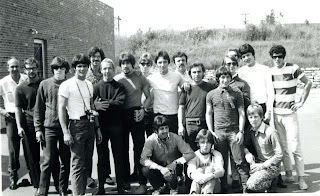 Garage aficionados know about The Staccatos from Ottawa, ON, a very popular Canadian group, but this one is not listed in their discography, or on any of their reissues. So my guess is that there was another "Staccatos", and were eventually picked up by the "famous" Davy Jones and re-released on his label as "Vinnie Basile" who was probably the lead vocalist. All this is speculation on my part though. And, finally, we found a Wikipedia entry (which references the Eric Lefcowitz book "The Monkees Tale" which, we told you a few weeks ago, is coming back into print later this month in a completely revised edition). Wikipedia states (using the book "The Monkees Tale" by Eric Lefcowitz along with the liner notes to the Rhino "Monkees Greatest Hits" CD) that Don Kirshner pressed a number of promo copies of what HE thought was going to be the new Monkees' single, "A Little Bit Me, A Little Bit You" backed with the early "R & B Version" of "She Hangs Out" on his own label, boldly named label "My Favorite Monkee - Davy Jones Sings" ... yet despite extensive searches on the web, I just can't seem to find a copy to share with you. Anybody got one? According to another Monkees website I found, Kirshner pressed his "promo" copies of the "My Favorite Monkee - Davy Jones Sings" "She Hangs Out" single AFTER he was dismissed as The Monkees' Musical Director. (A retaliation move perhaps???) 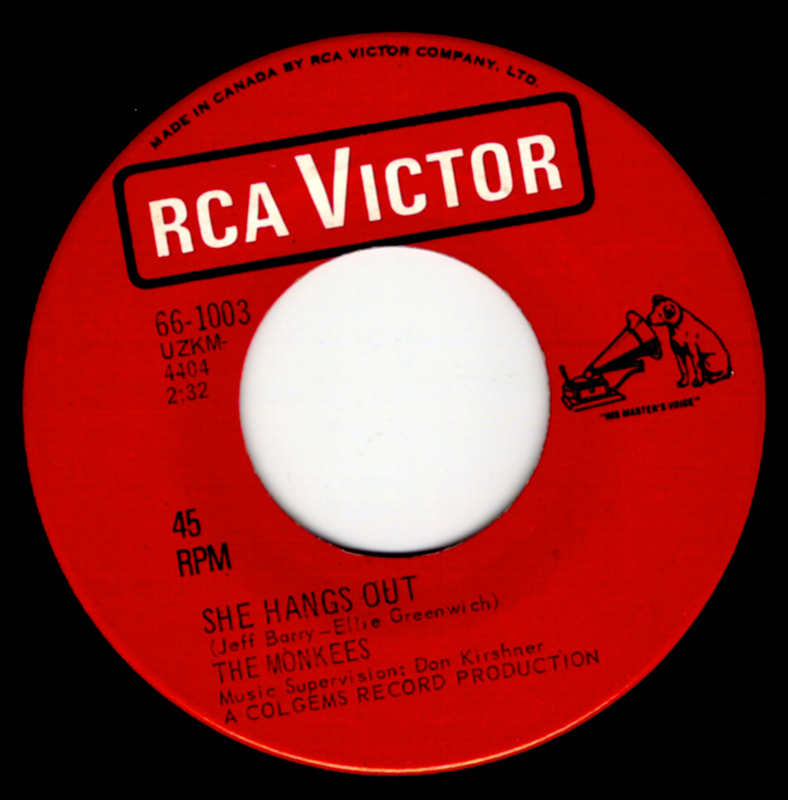 Kirshner was fired for releasing this single in Canada after a new contract negotiation stipulated that EVERYTHING The Monkees did from this point forward had to contain a minimum of 50% Monkees involvement production-wise. As such, The Pre-Fab Four wanted to release "The Girl I Knew Somewhere", a song written by Michael Nesmith and sung by Micky Dolenz as their new B-Side, which is the way this single came out everywhere else in the world. Truth is, it was also the better of the two recordings and ultimately charted on its own at #39 in Billboard Magazine. Toldja we were running behind!!! After our concert review ran last week, we received a number of new comments regarding The Star Plaza Show, Peter Noone and Micky Dolenz. In fact, this piece was originally supposed to run LAST Tuesday!!! Congratulations to The San Francisco Giants and any of their fans that may be on our list. We have friends and family in BOTH locations so it was tough to decide who to root for this year, especially with Frannie being from Texas. But I think it's safe to say that Giants CLEARLY out-played them throughout the series ... and really deserved to win. That being said, let's move on to some of your thoughts and comments regarding Peter Noone and Micky Dolenz! >>>Unfortunately, even if a film director WANTED to showcase Herman's Hermits music in a film about the Viet Nam Era, they most-likely would have been denied the opportunity to do so, thanks to the iron-fist tactics of one Allen B. Klein, who wouldn't license Herman's Hermits material for such projects. Again, check out our FH Interview with Peter for more frustrating details on this matter ... Peter had to go out and re-record "I'm Into Something Good" for inclusion in "The Naked Gun" film ... and then be careful not to make it sound TOO much like the original for fear of further scrutiny and legal actions with his one-time arch nemesis! (kk)He was such a pest and control freak, with only one thing in mind ... greed! Oh my gosh, what a column this morning! And awesome pic with Peter! You've added fun to my life with your writing. And an absolutely fascinating answer to my Micky / Oh! Darlin' question. You hold on to music stats like some men hold on to baseball stats. Very cool! I will never forget this whole experience! Don't know if you remember that - when the old WCBS - FM went off the air and was replaced by JACK-FM, Micky Dolenz was the morning DJ. Do you know if he DJ'd for any other stations? Great stuff as always and it brought back some memories for me. I remember attending quite a few shows in the 80's in Merrillville including a Doo-Wop show, The Beach Boys and none other than Rodney Dangerfield, who did his usual nervous entrance, walked on stage and said, "Hey I got it made now ... Merrillville, Indiana!" Next time just loosen up and enjoy yourself, ok? I have to laugh because unless, like you, one has experienced one of these "Pop Concerts", it is difficult to imagine why we have so much fun. Now, imagine being a child (as on my school's field trip a year ago) and you can understand that the awe (more like AWWWWWW) and thrill that you saw in their pictures was truly there. Some were so spell-bound they could not speak. Vance indeed is a great showman! The guy can wail on a guitar, is an incredible singer / songwriter and his stage presence is impeccable! Peter has to thank God he's got the Vance-man out there for every performance ... he was born to be a "Hermit"!!! He was nice enough to show me how he gets the guitar sound for "Mrs Brown" (cool stuff) and showed me the licks to the lead of "Listen People". Vance is the REAL DEAL! His new solo CD is incredible as well. Thanks for the very enjoyable and informative entry in today's blog. Yes, I'll admit, I'm a Noonatic who had to be content watching the Oklahoma Sooners lose to the Missouri Tigers on Saturday rather than getting to travel to what sounds like was a wonderful evening of entertainment! Of course we all know that Peter and the band put on a great show no matter where or when but having Mickey Dolenz open for them is a great two'fer! So glad you and Frannie were able to go and share your reviews and photos with us. Lucky Janis, who won her tickets, is the one of the most enthusiastic fans we've got - the girl has a way with words for sure!!! As always, Forgotten Hits is a good read! I've been listening to a great compilation CD called "When Pigs Fly" ... can you ask Peter Noone how he came to record "White Wedding"? We gave this CD quite a bit of coverage when it first came out back in 2002 ... quite an unusual (eclectic???) assortment of music to be sure ... everything from the really cool (The Box Tops doing the Blondie chart-topper "Call Me"; a great reading of "What A Wonderful World" by Roy Clark) to the REALLY bizarre (how about Don Ho singing the Peter Gabriel hit "Shock The Monkey"?!?! Ani DiFranco doing a duet with Jackie Chan ... yes, Jackie Chan ... on "Unforgettable", the remake duet that was such a bit hit for Nat "King" Cole and daughter Natalie a few years back.) The whole concept is artists doing songs you'd NEVER expect them to do in a million years ... The Oak Ridge Boys doing a better-than-you'd-ever-expect-it-to-be rendition of the Kansas classic "Carry On Wayward Son" ... and (get this!) Lesley Gore taking on AC/DC's "Dirty Deeds Done Dirt Cheap"!!! And that's why you get Herman's Hermits starring Peter Noone doing a very "popped-up" version of "White Wedding", the Billy Idol head-basher from twenty years prior! The CD is still in print (and only $12.98 through Amazon.com ... you can check it out here: Click here: Amazon.com: When Pigs Fly: Various Artists: Music) and, I have to admit, it's a WHOLE lotta fun to listen to. I was asked to be a part of a project in which the most unlikely people were connected to a song. I think the original idea was to connect me to an ozzie song but I thought was too obvious as he was doing the "sharrrrron" tv reality show at the time. David Polemeni and I chose white wedding by billy idol and I have to admit it was great fun recording it. the mrs. brown banjo still makes me laugh and herman singing 'nice day for a white wedding" makes me wet your pants! So Many Comments ... So Little Time!